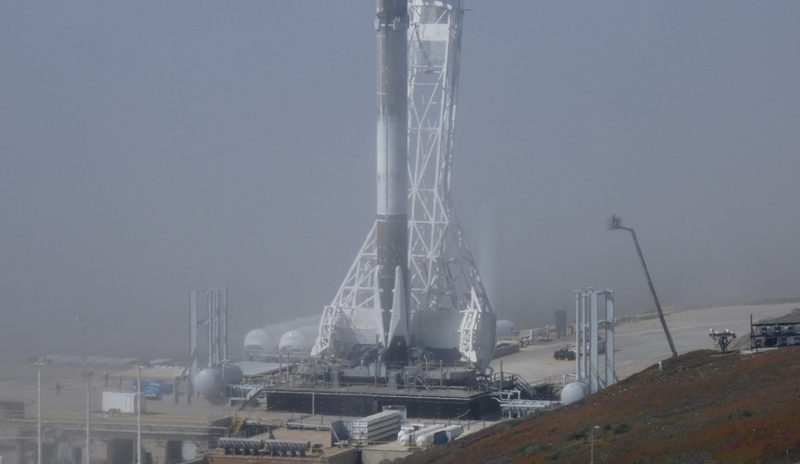 SpaceX conducted a Static Fire test on its Falcon 9 rocket for its second launch in May at Vandenberg Air Force Base in California. This specific Falcon 9 rocket includes the flight-proven core 1043, which launched the classified “Zuma” mission in January 2018. The rocket will launch 5 Iridium NEXT satellites for Iridium Communications and the two Gravity Recovery and Climate Experiment Follow-on (GRACE-FO) for NASA and the German Aerospace Center. Launch is scheduled for Tuesday. This launch will be the tenth overall by SpaceX in 2018, and the ninth this year for Falcon 9. The static fire test performed on this rocket is an important milestone for every SpaceX launch. Every mission flown by the whole Falcon rocket family has undergone one or more static fire tests – plus one or more Wet Dress Rehearsals for more important missions – prior to launching. The test is a simulation of the entire launch countdown – from rollout of the vehicle to the launch pad to a brief firing of the 9 Merlin 1D engines on the first stage. Due to this booster being a flight proven core – meaning that it has launched a mission previously, it is expected to perform a seven-second firing of the 9 first stage engines. All flight-proven boosters so far have performed seven-second test firings, while brand new, unflown boosters usually perform a three-second test firing. The test is meant to be a simulation and practice session for ground crews, engineers and flight controllers, and to ensure that the rocket, ground support and the Range’s systems are all working properly. The vehicle that conducted the static fire includes the first stage core B1043.2, which launched the classified “Zuma” mission from SLC-40 at Cape Canaveral on January 7, 2018. Core stage 1043 was first spotted on the first stage test stand at SpaceX’s McGregor, Texas test site on October 10, 2017 being prepared to do a static fire test. However, this would be a much longer test fire, close to or at the duration that the stage would fire during the actual ascent portion of its mission. After the test firing at McGregor, the stage then headed to Cape Canaveral to be prepared for launching the Zuma mission. Zuma was originally supposed to launch from LC-39A at Kennedy Space Center on November 15, 2017, but due to fairing issues from another mission, the launch was scrubbed. 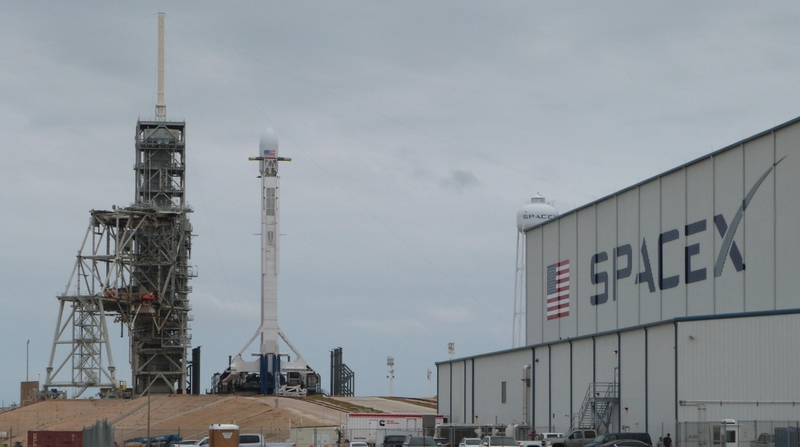 With the Falcon Heavy maiden flight waiting on final modifications to LC-39A to be finished – which were being pushed back due to Zuma’s Falcon 9 being at the pad – SpaceX decided to move the launch to SLC-40 at Cape Canaveral Air Force Station. After multiple fuel loading and draining tests on the vehicle at the pad, Zuma finally lifted off on January 7, 2018. The flight was a success, with core 1043 landing back at Landing Zone 1 at Cape Canaveral. The first stage was then moved horizontal and transported to SpaceX’s headquarters in Hawthorne, California to be refurbished for its next mission. After its refurbishment was completed, the first stage departed on March 19, 2018 for Vandenberg Air Force Base, a few hours north of Hawthorne, for pre-launch preparations. The mission that the rocket is being prepared for is the joint Iridium NEXT-6/GRACE-FO mission. 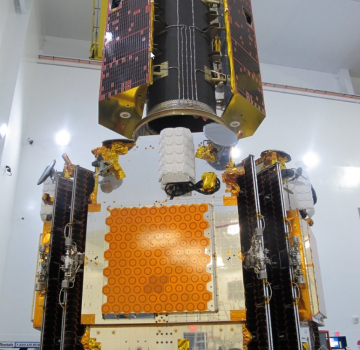 The payloads include 5 Iridium NEXT satellites, being launched for Iridium Communications, and the two Gravity Recovery and Climate Experiment Follow-on (GRACE-FO) satellites, being launched for NASA and the German Research Centre for Geosciences (GFZ). 5 Iridium NEXT satellites (bottom) and the 2 GRACE-FO satellites (top) stacked on their payload adapters. Credit: Iridium Communications on Twitter. This flight is the sixth for Iridium by SpaceX out of an eight-mission contract. Unlike the previous and future Iridium launches, this flight will have 5 Iridium NEXT satellites, rather than the usual 10. Iridium NEXT is Iridium Communication’s next-generation constellation to support their satellite phone network. It will replace the aging original Iridium constellation, which began launching in 1997. The new Iridium NEXT satellites feature faster data transmission and host a data receiver which will be used to track airplanes. Some satellites also feature a receiver that will be used to track ships. This flight also features the two Gravity Recovery and Climate Experiment Follow-on (GRACE-FO) satellites, which – as the name suggests – is a follow-on to the original GRACE mission – which ended in October 2017. The GRACE and GRACE-FO missions are a collaboration between NASA and the German Research Centre for Geosciences (GFZ). The two GRACE-FO satellites are near-copies of the original GRACE satellites and have been upgraded with more modern equipment, including new lasers for determining the distance between the two spacecraft. The GRACE-FO mission – and the original GRACE mission – are designed to study Earth’s gravity – especially gravity anomalies – and climate. The original GRACE mission revealed new information about Earth’s oceans, groundwater and gravity field, and GRACE-FO will continue its research. The GRACE-FO satellites are expected to function for at least 5 years. After this mission, SpaceX has around 16 more missions scheduled for 2018 – 15 Falcon 9 flights and 1 Falcon Heavy, although some of the later missions will likely slip into 2019. According to SpaceX CEO Elon Musk, they hope to launch more rockets this year than any other country.